Why do groundhogs emerge on February 2 if it’s not to predict the weather? According to legend, if the groundhog sees his shadow on February 2nd, there will be six more weeks of winter; if not, an early spring is predicted. Of course groundhogs – also known as woodchucks – don’t emerge at this time just to be furry weather predictors. So what’s the real reason? 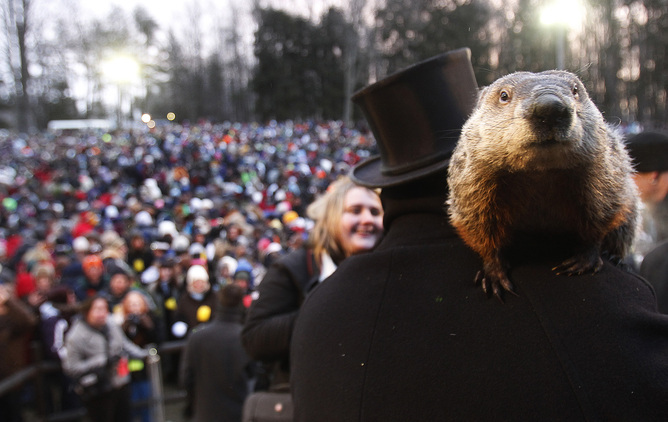 Research into groundhog biology shows they have other priorities in early February than mingling with the people of Punxsutawney, Pennsylvania. Groundhog Day appears to have European roots. Early February is midway between the winter solstice and the spring equinox, and throughout history this seasonal crossroads has been celebrated. The ancient Greeks and Romans observed a mid-season festival on February 5th in anticipation of spring. In the Celtic tradition, this period was celebrated as the festival of Imbolog to mark the beginning of spring. Early Christians in Europe embraced this tradition and celebrated Candlemas Day on February 2nd, to commemorate the purification of the Virgin Mary. Customarily on this day, clergy would bless candles and distribute them to the people in the dark of winter in anticipation of spring. In northern Europe, farmers needed some indication when to start spring planting. They looked for the emergence of hibernators, such as the hedgehog or badger, to signal the coming of spring. Since their emergence occurred in early February, it was believed that if Candlemas Day was sunny, and the hibernator saw its shadow, more wintry weather was ahead. But if it rained or snowed on Candlemas Day, the rest of the winter would be mild. This tradition was brought to America by the Germans who migrated to eastern Pennsylvania. They found groundhogs in profusion in many parts of the state and decided this mammal was a perfect replacement for the hibernators they’d left behind in Europe. Thus, the tradition continued in America. Female groundhog emerging from her burrow in late January. 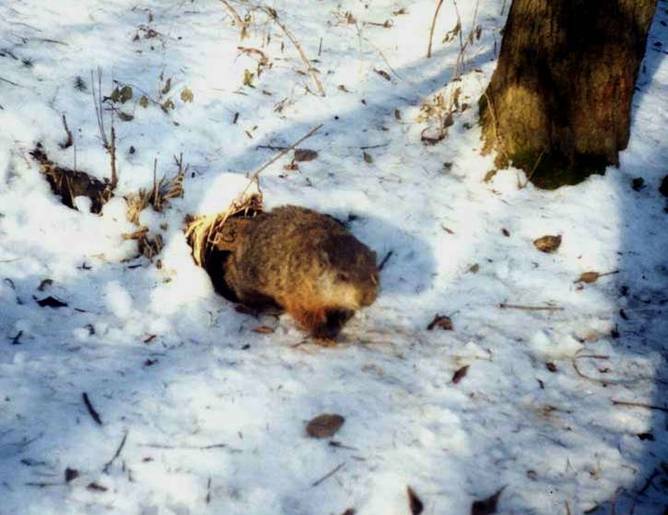 In my study area in southeastern Pennsylvania, the average date groundhogs emerge from their burrows is February 4. This fits the folklore and the timing of Groundhog Day. However, predicting the weather is not their objective. The real reason is related to Darwinian fitness – a measure of an organism’s ability to contribute its genes to the next generation. The process defines natural selection and is based on an organism’s ability to survive and to reproduce successfully. High Darwinian fitness suggests an individual will pass on its genes to many healthy offspring. Hibernation contributes to Darwinian fitness value. It enhances survival by saving energy during times of limited food availability. The ability to hibernate is found in several mammalian groups, including all marmots, many species of ground squirrels, chipmunks, hamsters, badgers, lemurs, bats and even some marsupials and echidnas. Curled up in their burrows, they pass the winter months, when food would be hard to come by. Hibernation is characterized by a significant drop in body temperature and metabolic function. This process is commonly called torpor. During torpor, body functions including heart rate, breathing rate, and brain activity are reduced. The overall benefit for the animal is saving metabolic energy at a time when it isn’t eating. This Maine groundhog had 17 torpor bouts where body temperature went up and down. However, for some still unexplained reason, hibernators arouse periodically during their hibernating season. These arousals come at a great energy cost. Therefore, arousing must be critical to survival in some way or animals wouldn’t waste the energy on it. Some possibilities include maintaining cellular functions or disposing of bodily wastes. In Pennsylvania, these bouts of torpor and arousal continue throughout the hibernation season, starting on average in mid-November and ending by the beginning of March; a total of about 110 days. 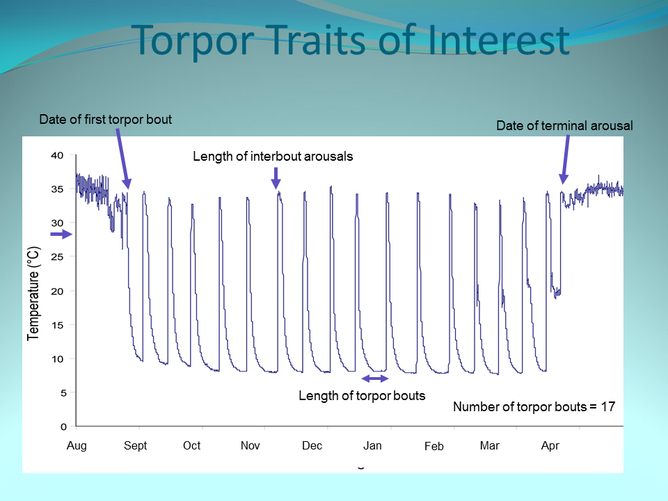 In one study, an average of 15 bouts of torpor occurred during this period, with arousals in between. Groundhogs aroused for about 41 hours and then returned to torpor for about 128 hours for males and 153 hours for females. In a 2010 study, we determined that the hibernation periods for groundhogs increase in length with increasing longitude. The hibernation period matches winter’s duration. The celebration of Groundhog Day would need to change by latitude in order to perfectly match groundhog emergence. Male groundhog (on the right) greeting a female groundhog for the first time after they emerge from their separate burrows. One of the drawbacks of hibernation is the reduced time available for reproduction. Thus, hibernators have developed mating strategies to maximize reproductive success. 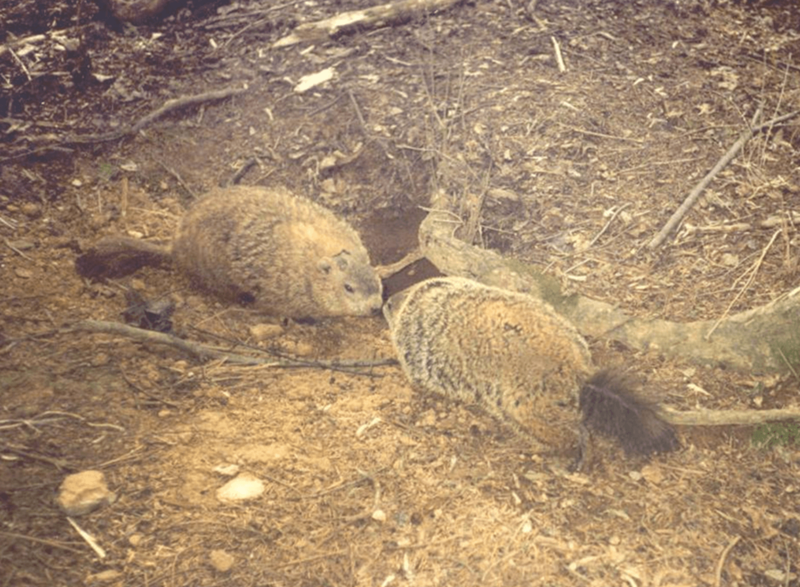 Groundhog mating strategies involve temporary emergence in early February, mating in early March during during their final arousal, and giving birth in early April. This behavior enhances reproductive success because young are born as early as possible (but not too early) and are able to start feeding in May when lots of food is available. That way they have enough time to gain sufficient weight to survive their first winter hibernation. But why do groundhogs emerge in February, when mating won’t occur until next month? The answer lies in their social structure. Most of the year, male and female groundhogs are solitary and antagonistic against each other. They aggressively maintain a feeding territory around their burrows and rarely have any contact with each other. February is used to reestablish the bonds necessary for mating and ensures that mating can then proceed without delay in early March. So for the animals themselves, Groundhog Day is more like Valentine’s Day. On February 2nd, groundhogs don’t emerge to predict the weather, but to predict whether their own mating season will be a success!